Careers in public relations can be extremely dynamic and creative. PR expert Allie Osmar shares what it is like to work in public relations. Alie, how would you describe the main responsibilities of your position as Partner and Digital Insights Lead at Loudpixel? Many companies are starting to become interested in what consumers are saying about them online. My job involves using specialized tools to gather conversation data and analyze trends in conversations that can be used to shape future programs or campaigns, measure ongoing programs, address potential crises, keep an eye on competitors and spot the conversations worth engaging in. It’s sort of a mix between new-age brand planner and PR professional. What does a typical day look like for public relations professionals? During my time working for a major PR firm, I put together a Video of A Day in the Life of a PR Professional but that’s not to say that was always typical. Now that I’m a partner at Loudpixel, I typically work from home or with a co-working group. Any given day could be a mix between executing monitoring and analysis programs using Radian6 and Loudpixel’s own proprietary tools, working with partner agencies to help them develop new research and monitoring programs and working on business development or marketing for Loudpixel. I love that I am helping to shape the future of an industry. The field of online conversation research and monitoring has really only started to emerge in the past few years, so companies are still looking for guidance on how to approach it. What are the most challenging things about working in public relations? The technologies and tools are always evolving. It’s important to constantly stay on top of things so that we’re always prepared to share a point of view with clients. Tell me about Loudpixel. How did you get started with this company? Loudpixel started as a Web development company between my fiancé and a good friend. It didn’t take us long to see that we all had skills that could complement each other and meet the demands of a growing market. They worked together to develop custom tools to make conversation analysis more efficient, along with brand dashboards to deliver that analysis in a succinct way rather than sending loads of emails and documents back and forth. We’ve started partnering with communications agencies to help them deliver to existing clients. It’s really a win-win. Brand managers get an unbiased look at what is being said about them, and the agencies get useful data and insights to help them plan future strategies. What was your professional background before you came to Loudpixel? I started out by working for large PR agencies in the Chicago area. I was actually recruited directly by the digital team of one agency through PROpenMic, a network for PR students, professors and professionals. 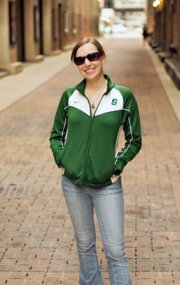 I received a double bachelor’s degree at Michigan State University in advertising and telecommunications with a specialization in digital media arts and technology. Internships were a large part of my education as well because learning in the classroom is one thing, but this field is all about practical application. What skills are most important to succeed in public relations? It takes a person who can pay close attention to detail, but still look at the big picture. What advice do you have for someone interested in careers in public relations? If a mid-career professional decided he/she wanted to make a career change into your career, what are the steps he/she should take to make a successful career transition? This field is really based more on real experience rather than specialized formal education. People working in PR and digital insights have very diverse backgrounds. It’s important to take a look at the experiences you already have and highlight how they can apply toward a new role. Are there any commonly held misperceptions about public relations careers that you would like to clarify? What is the income range for careers in public relations? Starting out in PR in a big city after college, expect to take a post-grad internship for around $10-15 per hour, plus overtime. If all goes well, this typically leads to an assistant account executive or account executive role at around $30-$40K, depending on where you are and what specialties you have. This range expands a great deal after a few years of experience. Check out Glassdoor.com for more details on specific cities and agencies. We have a great model with Loudpixel, and I think there’s definitely an opportunity to scale it. We’re hoping to grow our staff this year and help to define best practices for online conversation research and insights. Any other recommendations for people interested in careers in public relations? Thank you, Allie! This is great information. You can visit Allie Osmar’s blog at The Creative Career.